A brand new initiative of WorldLoop and Close the Gap is the Mobile Phone Collection project. Together with Raising Results, we set up a programme in October and November 2018 where employees of Ordina, Accenture and ENGIE could collect their old mobile devices. The campaign focused on the one hand on raising awareness among employees of the importance of e-waste, both on the environmental level as on the human level. On the other hand, the project also aimed at supporting innovative entrepreneurship by providing a tech start-up (Recy-Call) with the funds raised through this campaign. 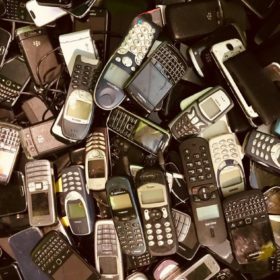 Recy-Call collects mobile phones through schools and is preparing a large scale collection in developing countries to combat worldwide electronic waste. Recently, they were featured as ‘starter of the week’ in Trends Magazine. The Mobile Phone project ended during the European Week of Waste Reduction (EWWR), an initiative aiming to promote the implementation of awareness-raising actions about sustainable resourceand waste management. Close the Gap submitted the project for the European Awards connected to this EWWR-initiative. We are happy to announce that our Mobile Phone project is nominated as one of the Brussels laureates for the Awards. An international jury will now look at all the laureates of different European countries. If positive, we will be invited to participate in the European Award ceremony in May, in context of the Green Week. Once again, this recognition shows the potential of the millions of unused mobile phones that can be found in households all over the world. With the 700 phones that employees of Accenture, ENGIE and Ordina collected last year, they saved more than 1.300kgs of mineral resources such as gold, aluminum and cobalt.